This guide will walk you through the steps necessary to create a bar chart as seen below. Select bullet bar chart after uploading your data. There are a number of specific features to make this particular chart type look even better. Let us show you how to make a beautiful chart in three simple steps. Outer bar: Select the column header that contains the numeric values that you want to see as the outer bars. 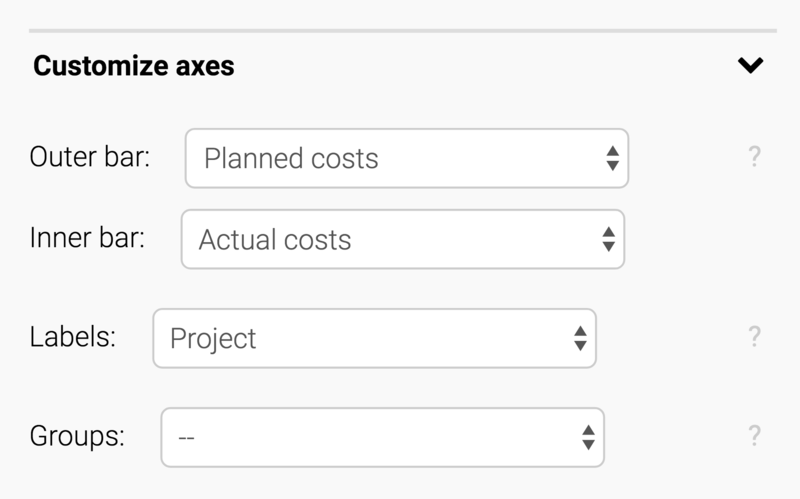 We'll choose the column "Planned costs" as our values. Inner bar: Select the column header that contains the numeric values that you want to see as the inner bars. We'll choose the column "Actual costs" as our values. These values should be the same measure (e.g. currency) as the values for the outer bar. Labels: Select the column header that contains labels and/or descriptions for each row of your table. These labels will appear before the bars. Groups: You can upload an extra column that will group our bars. In our case, we could have a column that states for each construction project if its started "before 2010" or "after 2010". If we chose that column as our "Groups", the chart would make a separation between the old and new construction projects. In this panel, we have just one decision to make: How should the bars and their labels be sorted? You can keep the order of your spreadsheet with leaving "Resort bars" unselected. Or you can sort by a column. This will put the longest bars at the top. If you want to have the largest bar at the bottom, choose "ascending". In the next panel, we can decide how the labels and numbers in our chart are displayed. Choose the number format "0%" or "0.0%" if you have a number that is a relative number, like in our case. This setting will add a percentage sign. For our chart, we will choose the number format "0", since we don't have interesting decimal places: We don't want to have the numbers "0.0b, 1.0b, 2.0b" in our axis ticks – "0b, 1b, 2b" is sufficient. 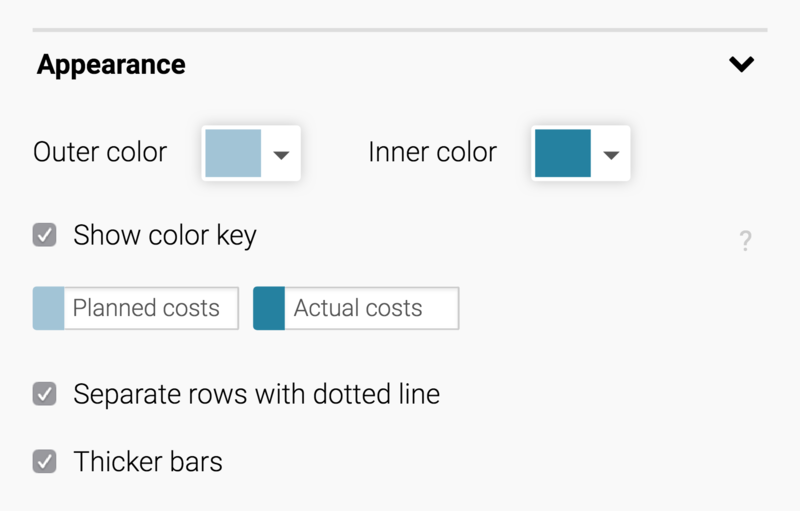 In the fourth and last panel in the tab "Refine", we can decide the design of our bar chart: Here, we can choose colors for our bars: We can choose one color for all outer bars and one color for all inner bars.